On this final Sunday of August, you might have better things to do then checking my blog… but if you do have some time on hand here’s a recap of what’s been posted this week : on Monday you could read all about the Vichy body lotion I won recently. On Tuesday there was a quote about liking your body (with a picture of me in bikini 🙂 now that’s a thing you won’t see often !). In the how-to-wear post from this week you could see three ways on how to style a seventies dress. The tips ‘n trips post from Thursday brought us to ‘The Bollekesfeest’ in Antwerp. There were two outfits this week : the outfit of the week (which had my blue chino pants in the lead roll) and as little black dress of the month you could see my summery black dress that I bought in the Provence a couple of years ago. Fireworks in the harbour of Cannes, France (summer 2014). This entry was posted in Lazy Sunday and tagged Cannes, cote d'azur, fireworks. I bought these blue chino pants, that take the lead roll in this outfit, at H&M in April… or was it already May ? They were not expensive at all, but I think they look great ! They’re really comfortable. So perfect for a trip along the D-day beaches a couple of months ago (as you can see in this post). I wore my chino pants casually with my Marcel tanktop and my sneakers… oh… what good times we had in beautiful Normandy ! It seems so long ago already ! Wish we could go back… Read more about this outfit! This entry was posted in Fashion, Outfits, Summer and tagged chino pants, dyerberg kern, Fashion, H&M, IKKS, outfit, outfit of the week, pants, tamaris. The LBD of the month is a dress I bought on holiday in the Provence a couple of years ago. We were staying in Saint-Rémy-de-Provence, which I can highly recommend visiting, especially on market day ! I like buying clothes on holiday. It gives that little extra, don’t you think ?? Every time you put something on you bought on holiday, it takes you back… but anyway, back to the LBD ! Read more about this LBD! This entry was posted in Fashion, LBD o/t month, Outfits and tagged fashion outfit, LBD, little black dress, natan, saint-rémy-de-provence. Cathedral from Antwerp, seen from the Groenplaats. 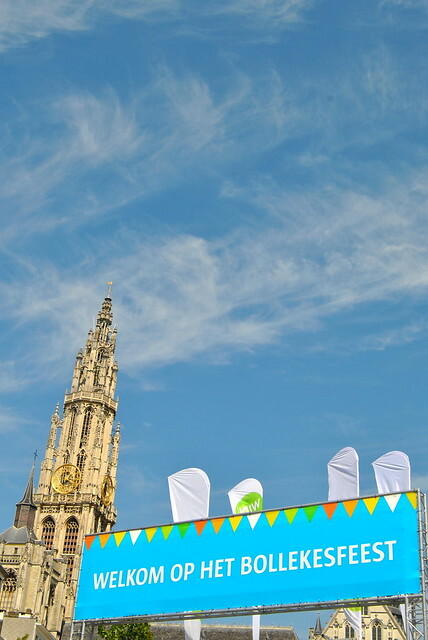 Antwerp has a lot of events, especially in summer. At the end of August you can enjoy the ‘Bollekesfeest‘ which is a series of activities throughout the town : music, dancing, markets, walks and cycle tours and of course eating and drinking (it wouldn’t be Belgium otherwise) ! Read about our trip to the Bollekesfeest in Antwerp! This entry was posted in Belgium, Travel and tagged antwerp, belgium, bollekesfeest, event, Travel, trip. Last Saturday you could see my seventies dress and how I styled it with my wedges. In this post you see 3 more combinations : with clogs, with platform heels and with high-heeled boots… which one do you prefer ? You can vote in the poll below the images. See two more styles + poll! This entry was posted in Fashion, How to, Summer and tagged dress, Fashion, outfit, retro, seventies. I like my body now (ish…). it was a ride with ups and downs though… I’ve already made my jo jo-confession (in this post), so you know that the scales aren’t exactly what you call my best friends. Every time I got them down to a weight I was ok with, I managed to get them back up again. Read more about the struggles I had with my body and weight! This entry was posted in Personal, Quotes 'n thoughts and tagged quote, ruby tandoh.